Groundwater Desktop (GWD) is a fully 3D interface for visualizing groundwater models and their results. 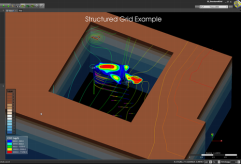 While GWD is flexible and might be used to visualize any model, development to-date has focused on MODFLOW, MODPATH, and MT3D, including the latest unstructured grid capabilities within MODFLOW-USG. GWD enables users to view the model numerical grid, input data such as properties and boundary conditions, and output data including heads, concentration, and pathlines. Models can be examined using cross-sectional, cut-away, and layer "exploded" views.